Cyperus echinatus is a perennial C4 sedge (Li et al. 1999), 30-100 cm tall, dark green, stems smooth, 3-angled, very tough, from short, knotty root rhizomes with tuberous enlargements. Leaves flat, tending to fold lengthwise along midrib, 0.3-0.8 cm wide; lowest bract longer than flowering stem. 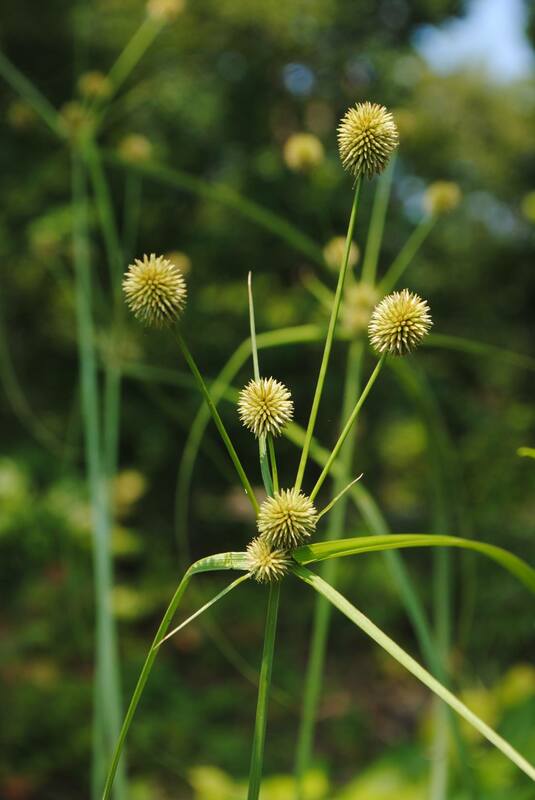 Flower spikes round 0.8-1.5 cm wide, densely flowered, with stalks (rays) of various lengths, 1-2 stalkless, central and 2-10 to 10 cm long, maturing spikes yellowish green or brownish yellow; spiklets tightly packed, radiating evenly in all directions, 0.3-0.7 cm long, 1-3 flowered, scales oblong, achenes 3-sided, oblong, brownish, about 0.2 cm long, July-Sept.
Habitat: Sandy swamps, upland barrens, disturbed areas, sandy fill.